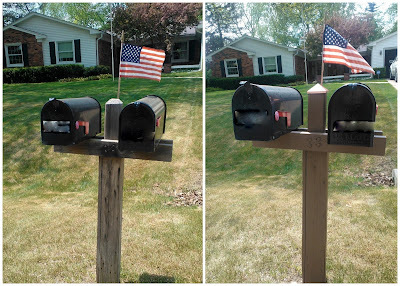 At this house the mail boxes are on our side of the street, I thought our mailbox posts could use a little refreshing. So for $7.50 and about 15 minutes I gave the mailboxes a fresh makeover. I painted the posts with Behr Solid Weatherproof Stain. A gallon runs almost $40.00 but the paint section sells an 8oz sample for $3.68, that was plenty to paint the whole posts. Finally, I capped off the top of the post with a new brass post cap that I found in the decking section for less than $4.00. I attached the cap with some Liquid Nails and it's ready to go!